Flare Audio Joins The MPG Benefactor Scheme! Flare Audio are proud to join the MPG Benefactor Scheme and offer our innovative ISOLATE® Ear Protectors to MPG members at a special rate of 30% off. ISOLATE® by Flare Audio Ltd is a revolutionary new, patent-pending ear protector, a long overdue solution for any music and events professional who works in loud sound environments. The ear protectors rival traditional foam or flanged ear plugs and are also ideal for home and other commercial uses. Traditional earplugs rely on absorption to attenuate sound, which rapidly meets its limit particularly with bass frequencies. ISOLATE® protectors reflect sound away from the ears and therefore achieve much greater attenuation, as they do not accept sound into the ear canal. Delivered with Flare’s discreet and stylish custom designed memory foam tips EARFOAMS®, ISOLATE® dramatically reduces sound without muffling or distortion. Live music sounds clearer, with increased detail and at safer listening levels. Ears are protected from loud noise that could otherwise damage your hearing. Live music professionals and music studio engineers will particularly appreciate the ability of ISOLATE® to block very low frequencies from entering their ears. Traditional ear plugs and defenders do not block the lowest frequencies, creating a muffled sound which, as well as being unpleasant to listen to, leaves wearers feeling disconnected or even “underwater”. Low frequencies produce the most energy, which is only partially absorbed by the plastic or foam of traditional ear plugs. For the first time ever, ISOLATE® blocks all sounds, including bass frequencies the sound you do hear is through bone conduction. ISOLATE® is micro in size and so can be used anywhere to isolate your ears from unwanted noise. 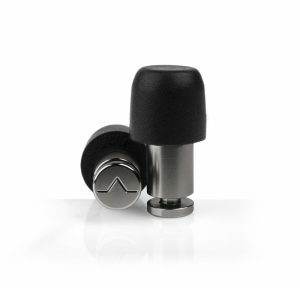 The first of their kind, made from solid metal (standard aluminum or the Pro titanium option), the micro protectors will help protect your hearing using Flare’s unique approach, making these ear protectors a more effective and enjoyable experience than standard earplugs. Grammy and MPG Award winning producer, musician. “I love the ISOLATE® Ear Protectors! Earplugs are basically the only way I can tour without going insane or killing one of my banmates, and these offer truly fantastic isolation.